Starbucks fans, you'll be so excited to hear the the Buy one get one FREE holiday promotion is back this year! This is always a HIT! 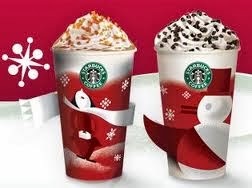 Stop by your local Starbucks between November 12th-16th and enjoy a Buy one get one FREE Starbucks Holiday Beverage. For more on this Buy one get one FREE Starbucks, Click HERE.